This week’s project for The Cutting Cafe is made from the Christmas Treat Cup Cards file, but this is a bonus ornament that is not a card! It is so cute and I can see many thing other than an ornament. If you add some hands and numbers around the rim, it could be a clock! It has a nice depth to it so you can get a good number of treats in it. You can use resin pieces like I did or you can add candy or nuts also. The back has a slide up tab to allow the goodies to come out. This is very easy to make and the card versions are also easy to do. You can make these without an electronic cutting machine as they come in PDF versions also! 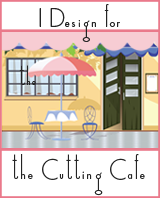 Make sure you stop by The Cutting Cafe Blog on the 7th and 21st of each month to see our design team posts. Leave a comment and you will be included in a drawing to win three free files!